Lust Red Sequin Stiletto Wine Bottle Holder (P/N SHOE221). The Red Sequin shoe will create lust and desire that will drive you crazy! Crafted of durable resin, this whimsical bottle holder shows you are a fashionista as well as a wine lover. 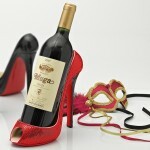 8 1/2 "H x 4"W.
Take your love of wine to new heights with our Lust Red Sequin Stiletto Wine Bottle Holder.